Its been a while since I’ve written. I started this blog in an attempt to get used to blogging before my Middle Eastern adventure began. I thought I’d be further into the process by now, but it seems that I underestimated the true nature of the Bureaucracy I’m facing. I wasn’t originally planning on posting about the boring steps of getting ready to go, but it’s now reached a level of absurdity, that I feel I should share. So for anyone who is planning on travelling to a country that requires paperwork to get in or get employed, enjoy the horror story and learn from my pain. The last time I was employed overseas it was in pre-Olympics China, and all I had to do was apply for a tourist visa to get in, and then my employment visa was done in person once I arrived. The Saudi visa process for employment is especially painful, but it isn’t just Saudi Arabian Bureaucracy, its the US as well. I was interviewed and hired in early May. They sent over a contract which I signed and returned in mid-May. The school sent me a list of things to do to get ready, stressing how very important it was to be able to send off my visa application BEFORE June 3rd. 1) Verifying my academic credentials – for which I had to gather official transcripts from three schools, notarized copies of my degrees, and letters from the registrar’s offices verifying my attendance to the school. The first two are a pain, but the schools and notaries are used to these requests, so still fairly standard. However, registrar’s offices are not accustomed to being asked for letters of verification that inlcued the student’s social security number. There is an online service called the Student Clearinghouse where employers or schools are supposed to go to verify attendance or degrees. So there were a couple weeks of emails and faxes trying to get these registrars to understand that I could not use this service and needed this very specific letter that someone was actually going to have to compose rather than automate. But wait, there’s more. These then must be sent to a separate office in Virginia to be authenticated by the Saudi Cultural Mission before they can be used as part of the visa application! The Cultural Mission’s instructions say to include a pre-paid return envelope. They specifically say no FedEx account numbers, but an envelope with the official words “pre-paid” on it. By the way, FedEx doesn’t do this. UPS does pre-paid envelopes, but they don’t say “pre-paid” they just say “return label” and when dealing with language barriers and bureaucracy, I wasn’t sure that would cut it, so the poor lady at UPS and I had to come up with a way to incorporate the words “pre-paid” into the label with the very limited options the software provided, and ended up putting it on part of the address line. 2) Police report of my (lack of) arrest record – which should be simple enough: fill out and print this form and mail it in with a check. But Seattle PD sent my form and check back to me because I missed an instruction, and I had to start all over again, adding more weeks to the process. And you thought I was being paranoid about the details. 3) Medical Exam – this was the most extensive exam I’ve ever had. Not all of the materials needed could be gathered on my single visit to the office, and I had to take home a sample kit and go to another facility for a chest x-ray. I could also only get to the Dr’s office one day a week, so a week after my appointment, I drop off the sample kit. And a few days later get a call saying it was the wrong one. So the next week I go back for the right one, and a week later return that. 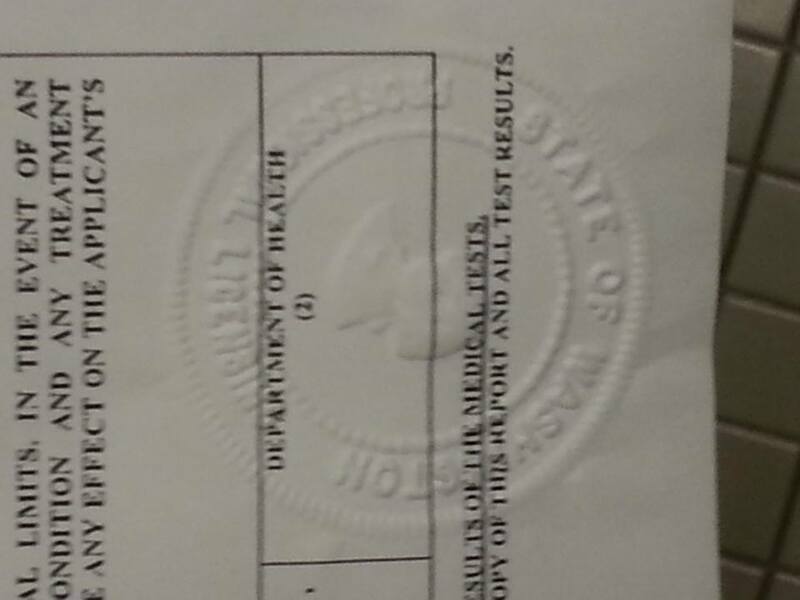 The final results were then sent to the wrong doctor… it took a month to get the form after my initial appointment. But wait, there’s more. It isn’t enough that a doctor has filled out this form in triplicate and I have two copies of the 15 pg lab report. I must get these forms stamped by the Department of Health, and this means a drive to the state capitol. This involved three hours of driving and 5 minutes of standing in an office to get three pieces of paper stamped. I should mention here, this part of the paperwork is only valid for 90 days, in this case from the date of my initial visit on May 28th to August 26th. I have to enter the Kingdom before August 26th or this paperwork expires, and I have to do it all over again. 4) Finally, the original letter of invitation from the company itself. There are other fairly simple things involved, like the actual visa application form, and a copy of my employment contract, but those are soooo simple, I’m not going into them here. The letter of invitation is issued from Riyadh, and is a document primarily in Arabic that includes (among many other things) my name and the visa block number that the company has obtained for my use. I cannot tell you why I do not have this yet, only that it is possibly the most vexing part of the whole process. At the end of June, I got an email from the Riyadh office confirming my address because they had a package to send me. Hooray! I thought, finally the letter. But, our FedEx delivery guy doesn’t think his job includes using the apartment buzzer on the front of the building, and instead just leaves the little note saying I wasn’t home (even though I was). This is July 3rd, so there is no way for me to get this again until after the holiday. I try to go online and request the package be taken to a drop off location instead of my apartment, but the website tells me that my address doesn’t match the address they have on file. What? So I end up sitting in the FedEx hub at 630 Monday evening waiting for the driver who won’t even try to deliver my package to bring it back so I can get it. I go through all of this, open the package and find a badly photocopied document in Arabic and the original employment contract. Now, I don’t need the original contract for anything, but I thought maybe they were just sending it along with a necessary document. But as I reviewed the visa application process on the Saudi Embassy website, I noticed a couple of problems. This document was a photocopy, not an original, and it had no sign of my name anywhere on it. Just to be meticulous, I searched all the Arabic numbers (Eastern Arabic is quite different looking than “Western Arabic” numbers we use here) to see if I could find my passport number anywhere, no luck. A couple more days of emailing with the school and I find out this is the company’s commercial registration certificate: a document I do not even need! Now, I know I won’t loose this job over a late start that is brought on by the lack of proper paperwork, because every other teacher is in the exact same boat. In fact, the school tells me I’m well ahead of most other teachers in processing my paperwork. What? But here I am, 42 days from the expiration of my medical paperwork, 38 days from the supposed start of my job, and I haven’t even been able to apply for the visa yet, let alone make any plans for departure including flights, when my last day of work in the states should be, when I can tell my roommate I’m moving out, when I can cancel my car insurance and cell phone service, and when I can throw the all important going away party. Well, first off, do your own research when planning to travel. I saw so many websites that assured me that my employer would take the lead in helping me process my visa paperwork, and while they have hired an agent to manage getting my application and fee to the embassy, they have pretty much been useless for everything else, and downright misleading in timing, since they told me to do my medical exam on or shortly after May 27th. From now on, reaearch employment visa procedures before or during job hunts rather than waiting until you’re hired and relying on the company to help. Secondly, appreciate the lesson in patience. There is nothing like conflicting bureaucratic and corporate systems to create a seemingly endless and unnavigable obstacle course, but you are not the first person, nor even the only person right now, trying to navigate it. Your plans and dreams will only fail if you give up. Finally, hold on to the story so that when you’ve finally made it to the destination you can look back and laugh, because it will be as nothing compared to all the new challenges you face while living and working in a new country. A little adversity makes the adventure more vibrant.